Having a hard time keeping up with your pet's daily dog routine? Let us walk the walk for you! Going out of town or your vacation rental does not allow your pet? Let us keep your pet in your home or in your pet sitters loving homes! 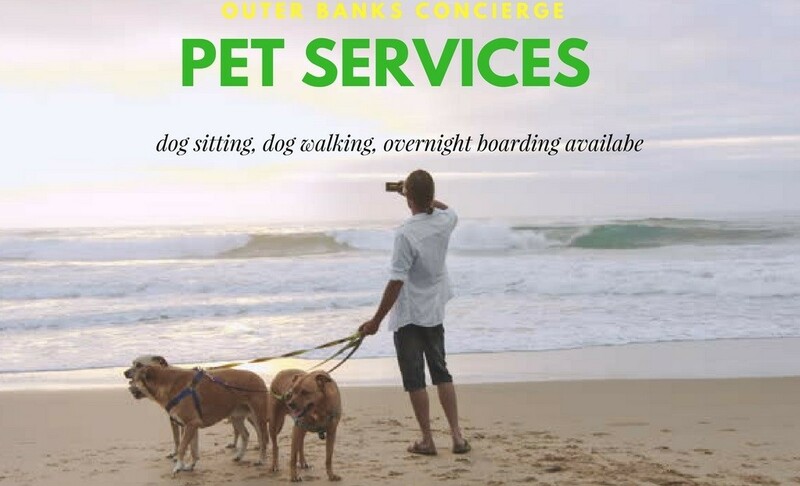 Local vendors are available to provide quality, professional in-home and our home pet sitting & dog walking services on the Outer Banks. Let us know about your busy week or vacation. We are here to make sure your pets are well cared for in the comfort of their own home. We come to you and provide honest and timely service to assure you peace of mind while you are away. We provide an In-Home specialist focusing on the needs of your pet in your home. We allow your pets to be able to stay home safe and happy and we come to you. We offer visits starting at 10 min potty breaks to long term care needed for over nights in your home while you are away. We take great pride in our stride of providing excellent service and commitment to you and your pets. You will never have a stranger in your home and your pet(s) will always have the same sitter that you have approved of. During our walk we make sure to keep tight control of your loved one. We do not allow strangers or strange dogs to approach and keep a safe distance from cars or potential harmful objects. Use of cell phones during our walks is NOT allowed to keep all focus on your loved one! Kitties don't get to go for walks but they sure do love they're play time as well. We provide great one on one play time with interaction of toys, laser pins or just some good love in our arms. Your pet will be placed in the home of one of our qualified sitters. They of course get to spend their days just like home with lots of love and attention and enjoy the free space of a fenced in back yard at the home of the sitters. No confinement of the home will they be placed in unless other wise requested from client. We arrive at the time frame of your choice for your free visit. We will then return between 8pm - 10pm and depart the next day at 8am. We provide excellent care over night in your home while your away. Your pet will receive all of their routine walks and care they are used to during the time we are there. We make sure your pet and home are safe and secure during your time gone. Please let us know if any extra visits are needed in between the time we are away. Does an Afternoon Daily Package work better for your schedule? Pricing based on per night. Day care rate of $30 added on last day for pick up after 10a.m.